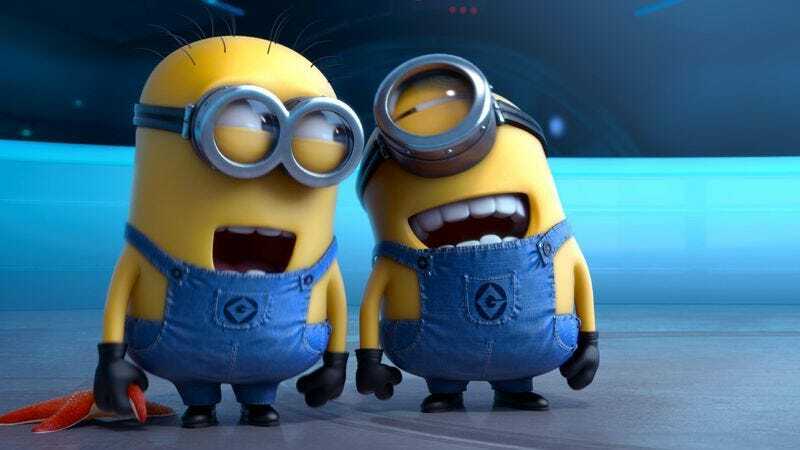 Minions dumb male characters yucking it up. In hindsight, the stars of Despicable Me and Despicable Me 2 aren’t Steve Carrell’s villainous Gru, or the adoptive daughters that humanize him. Nope, the real stars are Gru‘s minions. Thus it was determined that an entire movie should be based around the legion of bespectacled, anthropomorphic slugs that jabber incomprehensibly and inflict the type of slapstick violence that only Minions, Tom And Jerry, and The Three Stooges can reliably walk away from. And, like those other two groups, people have noticed Minions are uniformly male. According to co-director Pierre Coffin, there’s a simple reason for that. A quick search for “minions sexist” on Twitter reveals that there’s a back-and-forth between people who see the lack of even a single token female as being pretty lazy (even for the team behind Minions), and opponents rallying around Coffin’s answer as proof that overreaching feminists are trying to ruin great movies like Minions. Overlooking the fact that aside from having one eye or two, these creatures appear to be nearly identical, genderless, yellow Vienna sausages waiting to be stomped on, it’s probably worth noting that Minions seems to be egalitarian in its contempt for audiences of any gender. And if nothing else, this whole brouhaha probably just informed the “Smurfette creation myth” premise of the sequel.